Love, Life & Locks (London): The High Price of Fashion? Today's Daily Mail (newspaper) featured this none too flattering image of British Supermodel Naomi Campbell. Is this the price of fashion? Is this what being one of the first Black supermodels has cost her? Seriously, is this the price of beauty? Is this what is left after over 20 years of weaves, wigs and lace fronts? Or is she just having a bad hair day/month/year? Me & you think alike, lol. I just put this picture on facebook. However you were nicer with your comments. You put alot into perspective. I just assumed that the hair weaves and glue caused this but she might happen to have other issues. I just hope that is the case, because there is no way I would be walking around like that for the heck of it. I dunno what prejudice or nonsense she faced back in the early days which led her to make the choices she made then and still makes today. She was a pioneer... I hope her hair grows back. That was awful to see.The article mentions other celebrities who've lost hair too. 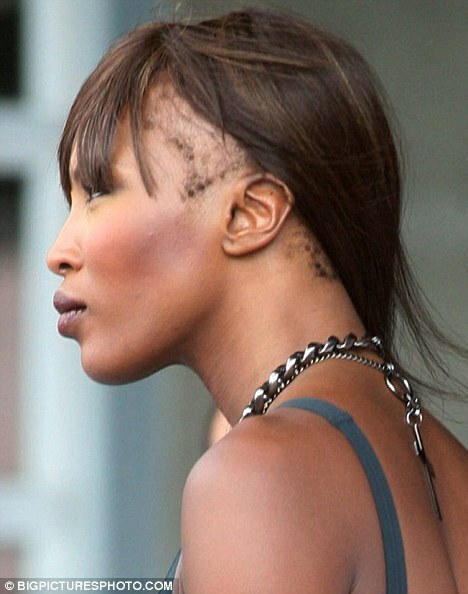 Hairloss can be devastating, especially when you don't know why or if it's permanent. I'm sure the weaving/extensions contributed - all the abusive practices and relentless assaults on hair and scalp. I hope she just uses a wig now. That's a shame, truthfully if it is that bad she should just shave it off and start over. She has the face and the body to pull it off! If this is due solely from constant use of weaves, then this is a shame and was an avoidable tragedy. Unfortunately I have seen and see a lot of women with this same type of hair loss directly due to relaxers or over use of extensions. We need to stop buying into the lie we have only one option in order to be beautiful and that hairloss is our inevitable destiny. @anthia-ofo: it is indeed devastating, my hairloss is back but I'm not brave enough to talk about it yet. The not knowing whether it will come back is the hardest part. @NESS: there seems to be a large body of opinion who would like to see her rock the bald look. While I agree with you that she could really own that - I wonder whether she has to self-confidence to back it up. @Expanding Beauty - I couldn't agree with you more! "We need to stop buying into the lie we have only one option in order to be beautiful and that hairloss is our inevitable destiny." Would you believe, this was in the daily mail photo and all!! Sister you are not alone, due to the baby hormones, I'm starting to lose my hair in the front and other areas on my head. I just noticed it like 3 days ago. I really hope that both of our hair grows back, because I'm relly not happy with my hair line. Due to the last pregnancy and hair loss I already have short locks in the front, I'm wondering if I will lose more locks, I really hope not, if so I might have to consider using extensions in the front until my hair grows back. Sigh.. heres to hair growing back really fast, If I so happen to come upon something that helps with hair growth I'll be sure to let you know.